Grasshopper component of AKL FlowDesigner is released! A Grasshopper component has been released that allows you to use “Operate objects”, “Condition setting” and etc. on the AKL FlowDesigner by an offer from the Mae laboratory at the University of Tokyo. 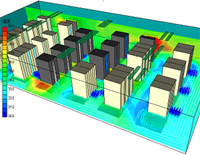 AKL FlowDesigner is 3D simulation software for air flow and thermal/contamination distribution. 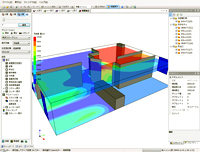 “Air Flow Analysis Simulation” technology or Computational Fluid Dynamic (CFD), which has been used in only universities and industrial labs, has been commercialized as a tool for everyone. That is “AKL FlowDesigner”. You can “visualize” wind flow and temperature distribution, which is hard to comprehend by scientific and technological analysis. 80% of users are fist CFD users. Almost all of them have realized the difference in their businesses. As a tool to “Visualize” Eco Design/Eco Proposal, it can be utilized design/implementation discussion, equipment ventilation design, or building-induced wind research, etc. It can be utilized for technical proposals to your clients. Experience the effects of evaluation of design ideas easily on PCs. It is very easy to adopt even for people who have never used, design and installation engineers, sales persons who would like to propose with technical proof. It requires only a half-day training to start using AKL FlowDesigner because of mouse-operation based simple user interfaces. Modification of calculation conditions is very easy so that comparison of different conditions becomes very easy. Automatic mesh generation and parameter adjustment implemented. 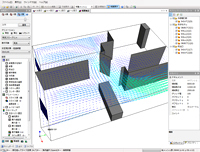 Made-in-Japan software which made designers utilize air flow simulation in daily operation. 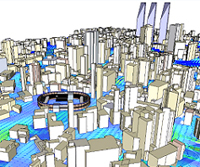 Air flow simulation is not just for specialists any more. Shows air flow, temperature, and contamination distribution changes as 3D animations. Grasping air flow made easy. “Visualizing,” too. Simulation is useful because it can evaluate many different conditions. We want you to see the analysis results and utilized insight from the calculations. These are the concepts we keep in mind to develop this software. 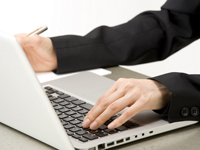 Is becoming a software expert your main objective? 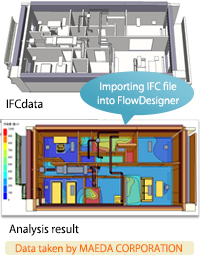 Importing IFC files and setting boundary conditions easily build analysis models. It will reduce time required to build analysis models significantly. 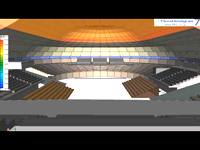 General purpose file format, STL widely used with CAD software can be imported. Import feature of SketchUp file format is now available. This makes many kinds of analysis easier, e.g. external wind analysis using geographic data. Import feature of 3DS file format which is exported from many kinds of CAD software is now available. Became easier to analyze CAD models and complicated models! Stability of calculation, and usability of modeling and mesh edit have been improved! Result output of wind pressure coefficient and wind weighting, and solar integration analysis are now available! 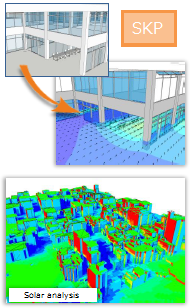 From urban spaces to electronic printed boards, various different spaces can be analyzed! Can be applied for many different applications. AKL FlowDesigner can make animation from analysis. Easily inspected transition of the conditions. And more analysis examples introduced. Professional and Enterprise (with additional Inverse analysis with Adviser module) editions are available. You can upload your models for us to check.